Unless you have been living under the rock, you must have seen or heard about Bitcoin HYIPs. Riding on the popularity of Bitcoin itself, Bitcoin HYIPs have also garnered traction from the internet audience. And nowadays anything related to Bitcoin gets typically a lot of attention irrespective of whether it is good or bad !! And that’s because Bitcoin has generated returns in 100s and 1000s of multiple for its early investors and now many wants to have a piece of it. But let me give you the benefit of the doubt if you haven’t heard about Bitcoin HYIPs because the whole point of writing this article is to tell you everything you need to know about Bitcoin HYIPs. A high-yield investment program (HYIP) is a type of Ponzi scheme, an investment scam that promises an unsustainably high return on investment by paying previous investors with the money invested by new investors. 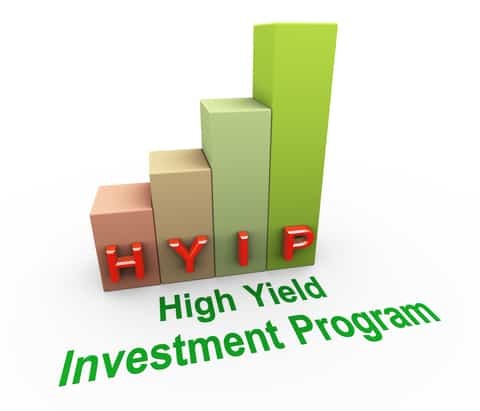 HYIP stands for High Yield Investment Program that promises unusually high returns in a very short period but this period can also vary and last for weeks, months, or years too. Many of you might have heard off Ponzi schemes, and HYIP is a form of Ponzi scheme where investors are promised absurdly high and unsustainable return on investment over a period of time. And incorporating similar idea Bitcoin HYIPs have emerged. Bitcoin High Yield Investment Program (aka Bitcoin HYIP) also lures investors to invest a small amount initially in Bitcoin and promises to give high ROI on it for hours, days, weeks or months in more bitcoins. And upon inquiry, you will find that most Bitcoin HYIP programmes invest in stocks, bonds, or crypto markets to generate subsequent profits for its investors. But if that’s the case, then why are they under a grey area? Well, that’s because they say something and do something else only !! Most Bitcoin HYIP are essentially Ponzi schemes that pay pioneer investors with inflowing money of newer investors. And anyone with some common sense should be able to make out that this is not sustainable because any investment cannot generate ROI without a sound business plan/logic. As a result, when new investors stop rolling the money in, the scheme collapses under its weight because there is no more money to give it to everyone who joined. Thus many investors who ultimately join an HYIP much later are left with huge losses to deal with. Can You Make Money With BTC HYIP? & How Bitcoin HYIP Works? The actual answer to the above question is both, Yes & No !! Yes, because as I told you, that certain early investors, do make money through HYIPs but that’s untill the funds from the new investors is rolling in. When the new investors stop joining, then the investors that had joined earlier don’t get their promised money, and the scheme turns unsustainable. Phase 1 (Launch): Admin of the programme launches a Bitcoin HYIP and pays the promised return to investors in BTC initially from his/her own pocket. Phase 2 (Momentum): Word spread about the ROI and the programme, and many investors start investing in the Bitcoin HYIP generating a net profit for the admin every day. Phase 3 (Downfall): Fewer investors are investing in this period, so the daily profit of the admin is dwindling since he had to pay to other investors too. Sensing the right time and right profit accumulated for himself/herself, the admin stops paying investors and runs away by shutting down the website. But the irony is, many people know about this, yet they fall for such scammy HYIPs, and that’s because they are not able to identify them due to lack of knowledge or due to their ignorance. How To Identify a Bitcoin HYIP? Promising absurd returns in a day or month like 5% or 100% respectively. Asking you to bring other investors to keeping rolling your profits & membership. No business plan or a very vague business plan on the website. Inconsistent information and fairly new domain hosted on cheap servers. No social media profiles or team information is given on the website or fake information. Fabricated testimonials and stupid spelling errors on the website. 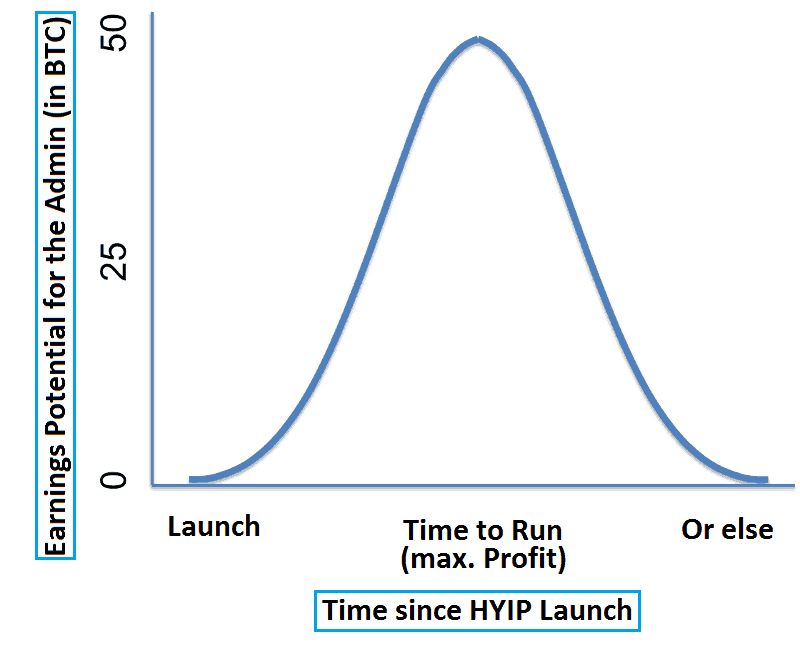 Conclusion: Should You Invest In HYIP? Well, if you still have this question, then I am not sure what to say? Of course, after knowing the reality of Bitcoin HYIPs, anyone who is serious about the investment will not invest. Moreover, crypto in itself is too risky and volatile which requires a lot of research from the investor’s part and when you decide to get into Bitcoin HYIP, you need even more strenuous research. But in my opinion, there is no point looking at any Bitcoin HYIP because history suggests that all the Bitcoin HYIPs have stopped paying at some point. And still, if you want to invest, be prepared to lose everything that you put in !! So that’s all from our side in this introductory myth buster on Bitcoin HYIPs, and if you haven’t read our guide on Bitcoin Doublers, which is another type of Bitcoin HYIP, you should read. Lastly, I hope this helps you in making better decisions. And If you liked this article? Do share it with your friends and family on Twitter! !